Anyone who would like to know more about their surrounding environment may be interested in a new wearable sensor called the Scarab that has been created by the Amulet Corporation. 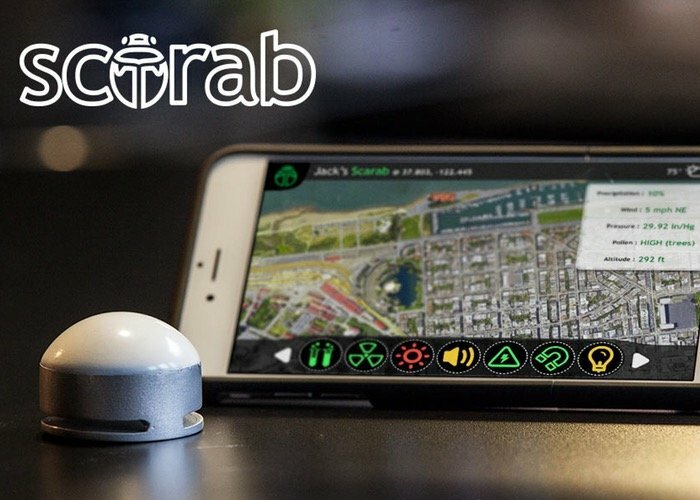 Scarab takes the form of a small sensor packed dome shaped wearable device that has been designed for the consumer market and can analyse the local environment around you as well as building a safer community. “Scarab is a wearable sensor platform that has more sensors than any other personal consumer product. These sensors continuously monitor your environment and communicate local conditions and hidden dangers to your smartphone and the web. The Scarab project is currently over on the Kickstarter crowd funding website looking to raise $100,000 in pledges to make the jump from concept to production. Watch the video after the jump to learn more about the Scarab wearable sensor project and see it in action. So if you think Scarab is something you could benefit from, visit the Kickstarter website now to make a pledge and help Scarab become a reality.